Guest Post by Joy Preble, author of Dreaming Anastasia. We writers are cyber-stalkers of other writers and frankly, why else would we all be on Twitter? So, I'd been monitoring Joy because she was cool. Why was she cool? Because she wrote about Baba Yaga. What more reason could you possibly need? So, as luck would have it, I met Joy at Orlando and we talked, and talked and talked. All things Russian and everyting inbetween. So, why do you need me waffling on? Here's the woman herself. Enjoy. Amazingly, when I finished the first draft of what would eventually be titled Dreaming Anastasia, Baba Yaga was not a character. In that first version – which actually garnered me an agent! – Anastasia was in some sort of blue light mystical holding zone that Anne and Ethan accessed by discovering a secret portal in Chicago’s Art Institute. Yes, I know – portals? Waaaay over done. But I was a newbie. I’d loved that portal in season 2 of Angel went the gang went to Pylea and saved Fred and Cordy got to briefly become royalty…Excuses, excuses. After that, I started reading – and once I did, I was hooked. Baba Yaga was – is – amazing. This primal, unpredictable woman with many fluid identities all rolled into one: maiden, mother, crone. The Bone Mother, she is sometimes called. The essence of all womanhood, of life, really. She was the perfect figure for a story that was going to be about life and love and death and second chances, about the passions that compel us, form us, and sometimes, destroy us. I loved so much about the old girl – this ancient witch with iron teeth and removable hands who lived in a hut on chicken legs so she could outwit and outrun her enemies. Her forest was a place of transformation. Once you entered, you might come out alive, you might not, but either way, you would never be the same. It became one of the conceits for the novel – both Anastasia and Anne and ultimately the other characters as well, would have to travel to Baba Yaga’s forest. None of them would ever be the same again once that journey occurred. I even loved the way she traveled; Baba Yaga flies through the skies in a mortar, stirring the air with a pestle. The idea of grinding appealed to me greatly – that this witch would desire to metaphorically grind Anne down to the bone and see what would be left. One of the classic Baba Yaga fairy tales became Anastasia’s story: the tale of Vasilisa the Brave. In the original tale, Vasilisa’s stepmother sends her to Baba Yaga’s forest to get light from the witch. It’s a little bit Cinderella, a little bit Hansel and Gretel. Of course, this is supposed to be a death sentence and Baba Yaga’s supposed to eat Vasilisa. But the girl’s real mother had given her a magic doll before she died. And the doll helps Vasilisa outwit the witch. 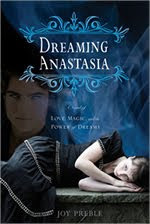 In Dreaming Anastasia, Anastasia has the doll her mother gave her. And like the original story, the doll talks to Anastasia and helps her survive. Like in Dark Goddess, the doll becomes quite significant. Because I decided to use a matryoshka doll – as did you! (great minds and all that-Sarwat) – the nesting aspect becomes a metaphor for much of what occurs. As Baba Yaga says to Anne, “Stories within stories. Secrets within secrets.” So that bit of folklore combines with Baba Yaga herself. This book sounds totally awesome!